A BELFAST family who lost a loved one to heart attack at a sporting event have dug deep to help others by donating £6,000 to place defibrillators in nine local parks. 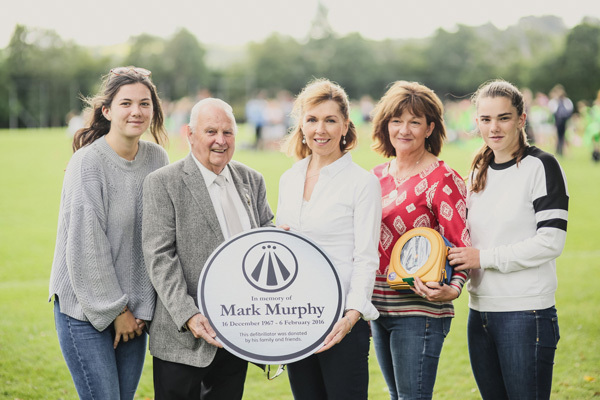 Members of the Murphy family recently unveiled of one of the defibrillators in their local South Belfast park, Cherryvale. They also presented a £6,000 cheque to Alderman Tommy Sandford, Chair of City Hall’s People and Communities Committee, to cover the cost of installing defibrillators in more parks across the city. The Murphy family began fundraising following the death of Mark (48) – a husband, father and brother – in February last year. Local man Mark, a scout leader in Skerries, Co Dublin, had spent many happy days playing at Cherryvale during his youth. “It has allowed the council to extend its programme of providing defibrillators in local parks,” he added. Paula Murphy-Durkan said that it was only after Mark’s death that they became aware of research which showed survival chances for a heart attack victim decreases by 10 per cent for each minute defibrillation is delayed. “This grim statistic really highlighted the importance of having publicly accessed defibrillators in parks and playing fields throughout Belfast,” said Paula. “Initially we decided to fundraise for a defibrillator for our local park Cherryvale, but thanks to the generosity of friends, family and others we are able to pay for a total of nine defibrillators. “We have been overwhelmed by the response and thank everyone who helped raise funds including Phoenix Cycling Club and VC Iveagh. Their members cycled the equivalent of Everest – 8848 metres – at Stormont over a period of 23 hours to raise money. “I also want to thank Belfast City Council officers for their help and the Council for taking over the maintenance and management of the defibrillators,” she added. Defibrillators have now been installed in Cherryvale; Botanic Gardens; Woodvale Park and playing fields at Grove; City of Belfast; Woodlands; Wedderburn; Blanchflower and Henry Jones as a result of the generosity of the Murphy family.